Double slide nylon coil zip perfect for bags. 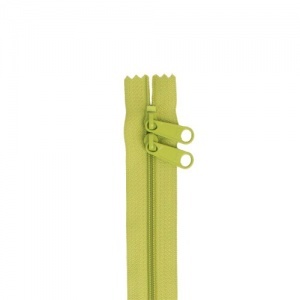 Apple green in colour, size 4.5 and 30inch length - the double slide means you can open your bag from either end, or it can be cut to form two separate single slide zips. Double slide nylon coil zip perfect for bags. Black in colour, size 4.5 and 30inch length - the double slide means you can open your bag from either end, or it can be cut to form two separate single slide zips. Double slide nylon coil zip perfect for bags. 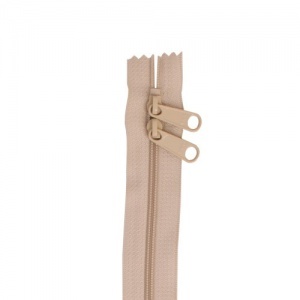 Light beige in colour, size 4.5 and 30inch length - the double slide means you can open your bag from either end, or it can be cut to form two separate single slide zips. Double slide nylon coil zip perfect for bags. Pewter grey in colour, size 4.5 and 30inch length - the double slide means you can open your bag from either end, or it can be cut to form two separate single slide zips. Double slide nylon coil zip perfect for bags. 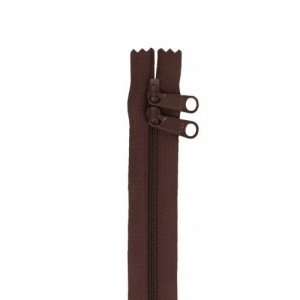 Dark brown in colour, size 4.5 and 30inch length - the double slide means you can open your bag from either end, or it can be cut to form two separate single slide zips. Double slide nylon coil zip perfect for bags. 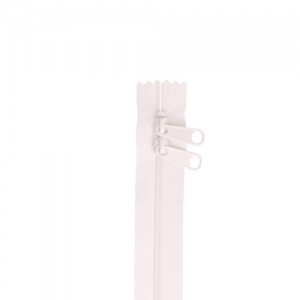 White in colour, size 4.5 and 30inch length - the double slide means you can open your bag from either end, or it can be cut to form two separate single slide zips. This range of bag zips from ByAnnie are designed specifically with bags in mind. They are #4.5 nylon coil zips - the wide zipper tape makes insertion easy and unlike zips with chunky, molded polyester teeth, these handbag zips are soft and flexible, making them easy to sew through. They also have an extra long pull, making opening and closing your bags easier. The double slide lets you open your bag from either end, or you can create two smaller single slide zips if only a small opening is required - the long 30 inch length means you can have two zips up to 15 inches in length. In a variety of colours, the ByAnnie zips are perfect for bag making! Please click on a By Annie double slide bag zip for more details.